Dainty and dazzling, these diamond earrings create a sensation. Crafted in exquisite 18K white gold, the pair of earrings feature round 72 natural diamonds in a lovely leaf pattern. These shimmering earrings secure with hinged backs and have a stem thickness of 1.2 mm. Make luxury most wearable. 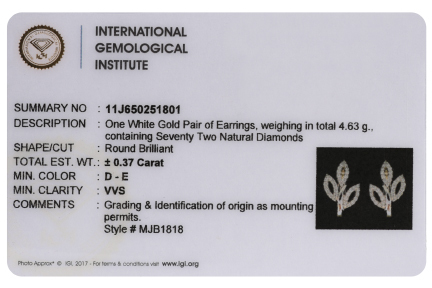 IGI Certificate and lifetime guarantee is available with the purchase. Want the same design in yellow gold? Click here.